(Verso, mount) upper center, in pencil: "Marchand d'Abatjours" upper right, in pencil: "3196"
While this engaging lampshade vendor holds out several colorful examples in his hands, others of various styles poke awkwardly out of a handmade basket on his back. Standing against a sharply receding old cobblestone street and plying his trade on foot, this old-fashioned street merchant epitomizes a fast-disappearing way of life in urban Europe. The gas lamps for which he sold shade were being rapidly replaced by electric lights, though this process took longer in Europe than in America. 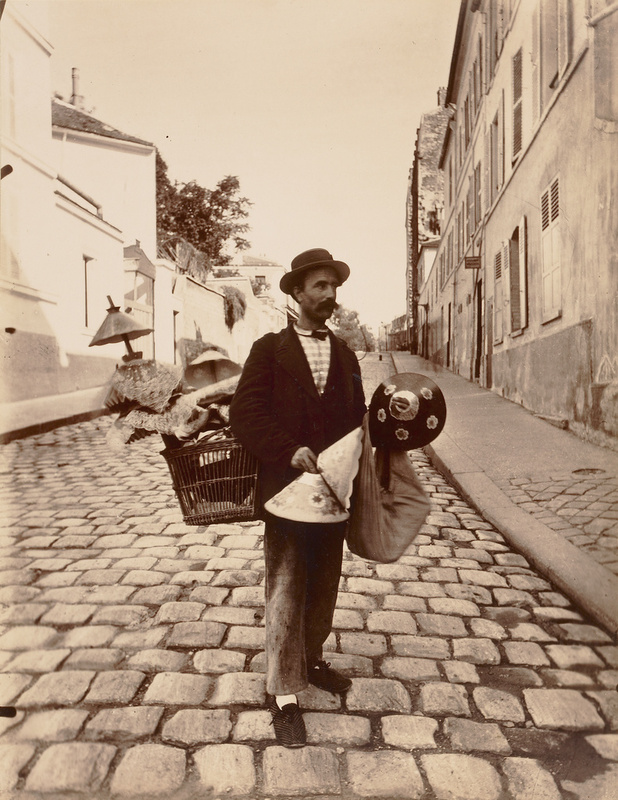 Around the turn of the century, Atget produced a small series of photographs on various street merchants, a subject traditionally portrayed by French graphic artists. As a photographer of "documents for artists," Atget recorded these figures in the hope that they would be of use to his clients. Indeed, the images were often used as source material for postcards and wood engravings. Estate of Eugène Atget, French, 1857 - 1927, sold to Berenice Abbott, 1927. Baldwin, Gordon. In Focus: Eugène Atget: Photographs from the J. Paul Getty Museum (Los Angeles: J. Paul Getty Museum, 2000), pl. 7.